Use with tab top curtains, eyelet curtains or pinch pleat draperies. 8 foot smooth 1 inch metal curtain rod. Metropolitan modern curtain rod look. 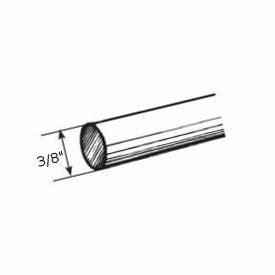 Select wood curtain rod pole 2 1/4" diameter, 12 feet long. Available in 4,6,8 and 12 foot lengths. Ten colors to select from plus unfinished. Base Price is for unfinished rods. Colors will show price in the cart. Note: 12' rods have to be shipped by truck. Metal hook slides for 9600 track rod. Super heavy duty window drapery rods. White finish. Projection, 5 to 6 1/2 inches, outter rod. Clearance 4 1/2 to 5 3/4 inches, outter rod. A commitment to quality. Graber super heavy duty features include a universal front loading end bracket, metal adjustable and reversible master carriers ball bearing end pulleys, a spring loaded side gate for adding or removing slides, molded, canted slides, can be converted to one way draw, scored center support base for easy mounting on narrow casings, universal cam lock stirrup, braided polyester cord, and angled tip on overlap arm. Instructions for hanging curtain rods are included. White finish. Heavy fabrics, no problem with the heavy duty track system by Graber. Projection, 2 3/4 to 4 1/4 inches. Clearance 2 to 3 1/2 inches. Graber adjustable drapery rods are heavy duty features include a universal front loading end bracket, a spring loaded side gate for adding or removing slides, molded, canted slides, can be converted to one way draw, scored center support base for easy mounting on narrow casings, universal cam lock stirrup, braided polyester cord, and angled tip on overlap arm. CS contract system aluminum extrusion white powder coated finish lubricated for wall or ceiling mount. Designed for hotel, hospital or any heavy duty application. Double wood brackets for Select Wood 2 1/4" diameter wooden curtain rods in front and 1 3/8" cod in back. 4" H , 2 3/4" and 6" return. Note: base price for unfinished, colors are more and will display price in cart. Select wood decorative traverse rod with 1 3/8" wood facial over select premium traverse rod. Ten colors to select from plus unfinished. Finials optional, search select wood. Base Price is for unfinished rods. Colors will show price in the cart. Price includes 3.5 plain carriers per foot and standard wall brackets that have 3" to 4" returns. Note: Rods over 100" have to be shipped by truck. Custom Expressions smooth or reeded wood poles 3"
3" smooth or reeded wooden curtain poles are available up to 16' in length. Use for large rooms and extra wide windows. Custom Expressions is a program for wood curtain rods and accessories that allows you to select from seven custom finishes or select any color from Benjamin Moore, Duron or Sherwin Williams color selectors. Wooden curtain rods are available up to sixteen feet. Wood poles over 100 inches will have to be shipped by truck. 1-3/8" americana smooth decorative drapery rods 66"-120"
Finish Satin Brass. Adjustable curtain rod. Clearance 2 1/2" to 3 1/2", return 3 1/2" to 4 1/2". Rods are metal, finial and slides are plastic. Adjustable curtain rod. Complete set. Includes 28 rings, brackets and finial. Studio Coordinates stock decorative traverse rods. 51248-110: 1-3/8" americana smooth decorative curtain rods 100-180"
Feet, Minimum 12 feet. Anodized aluminum, white finish. Low profile, 5/8 x 1/2 inch, ceiling mount cubicle track. Kirsch architrac 9046 series can be angular bent using 12 inch or 8 inch radius or circular curved For grommeted cubicle curtains or hand draw, pinch pleated draperies. Architrac Series 9046. Ceiling mount only, for mounting ceiling curtain rods. 0582-054: 7/16" sash curtain rod 18"-28"
0582-063: 7/16" curtain rod french door-sash curtain rods 18"-28"